Waringstown are almost certainly one victory away from the NCU Premier League title - but only after a truly dramatic two-wicket win over CIYMS at The Lawn on Saturday. The villagers appeared to be coasting towards a routine victory after CI experienced an astonishing batting collapse on their way to being bowled out for just 68 batting first. Phil Eaglestone, the left-arm seamer and leading wicket-taker in the division, ripped through their top order, trapping dangerman Chris Dougherty lbw in the first over and then bowling Nigel Jones as the former CSNI captain attempted a bit shot two overs later. Eaglestone claimed four wickets in that first spell but it was when the spinners came into the attack that the real collapse happened. Gary Kidd and Kyle McCallan each took three wickets apiece as CI lost their last five wickets for just three runs. The CI innings was done and dusted before 12.30pm and all thoughts appeared to be turning towards an early finish. But it quickly became clear that this was going to be no easy task on a pitch offering seam movement to a fine CI attack. Johnny Thompson removed James Hall with a searching delivery in the first over of Waringstown’s reply and then James McCollum drove at a wide one and edged behind. Lee Nelson won’t care to remember his flashing drive at Nigel Jones which was eventually held at slip and at 13 for three it was game on. Adam Dennison and Ruhan Pretorius eased the nerves with a 22-run stand for the fourth wicket and the South African professional struck five boundaries on his way to 28 from 43 balls. Dennison drove into the hands of cover and the game-changing moment was Pretorius’ dismissal with the score on 51 for four. That sparked another significant collapse, Waringstown losing four wickets for four runs to slump to 55 for eight. David Dawson was caught and bowled, Kyle McCallan pulled a long-hop from Trevor Britton (3-13) and Greg Thompson was given lbw as he tried to work Jones through the leg side. It all came down to the ninth-wicket pair Jonathan Bushe and Gary Kidd. They needed 14 runs for victory and to their credit, it rarely looked in doubt. Bushe swept one boundary off Britton and his 10 not out from 11 balls may prove to be one of his most valuable innings for Waringstown. Next up for Nelson’s men is a trip to Wallace Park on Wednesday night to face Lisburn. A victory in the rearranged 20-over clash would leave Waringstown as almost certain title winners. Their nett-run is so much better than North Down, their only realistic challengers, that if the two teams finish level on points the villagers would take the trophy. The game is scheduled to start at 5pm at Wallace Park with new professional JP de Villiers due to take make his debut. The new was not as good from Magheramason in the North West as the seconds lost out in the final of the O’Neill’s Ulster Plate competition. Waringstown were strong favourites against Brigade, bowled out for less than 20 in their previous two matches. But with Brigade’s firsts not in action, Alan Waite’s team ran into a number of high-profile players. Waringstown were 14 for three early on before recovering to 170 for seven courtestof half-centuries from captain Alan Waite and Michael Hingston. However they were undone by an unbeaten half-century from David Murdock, another batsman who is certain starter in Brigade’s first team. 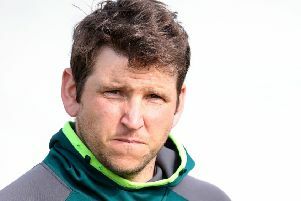 Waringstown have signed a replacement overseas professional for Ruhan Pretorius - Juan De Villiers, a 26-year-old who plays for the Titans and Northerns in South Africa’s domestic competitions. De Villiers will play in the Irish Cup final against Merrion. A fast-medium bowler, De Villiers has played 89 first-class matches and taken five five-wicket hauls. He has a first-class batting average of 22 with three half-centuries and one hundred. “I’m obviously delighted we have been able to bring in someone of JP’s calibre,” said Waringstown captain Lee Nelson. “He has performed exceptionally well in both franchise cricket for the Titans and in the Lancashire League. Thanks go to Councillor Marc Woods for ball sponsorship.